It almost seems like lace is interwoven in our lives. This most delicate of fabrics, first appearing in the portraits of Italian Renaissance beauties, is a rite of female passage, from bride to widow, white to black. And, most importantly, it can enhance our wardrobe now. When lace is of high quality, and of the rich dark-jewel colors favored for Fall, it can make any occasion even more special, from cocktail party to wedding reception. Whether it's picking up on the Victorian trend we're loving or adding feminine flare to an edgy silhouette, lace is definitely having a moment. Antonio Berardi Sheer lace sleeves and tiered cuffs give this midnight-blue confection a regal air, which is offset by the dramatic deep V-neck. Bellissima! Bottega Veneta Vertical panels overlaying lace and a V-neck create a long, lean line on this timeless LBD. 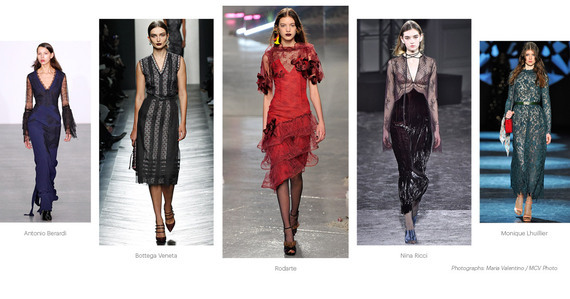 Rodarte Ruby-red Chantilly lace, ruffles and rosettes! This is as romantic as a dress gets. Nina Ricci Boudoir dressing worthy of a courtesan. The strappy neck detail and sheer bodice are a tad risque. Do you dare? Monique Lhuillier The pale lining on this hunter-green dress highlights the delicate pattern of the lace and provides a dash of peekaboo sexiness to the long-sleeved silhouette. Make It Modern While lace has a rich history, it can bring sophistication to a modern design, as with the sleek silhouette of the Elie Tahari dress in Bellamy lace, the fitted sleeveless impact of the Ann Taylor circle lace shift dress and the A-line silhouettes of the bow-embellished lace dress from Marc Jacobs and the damsel lace of the Nanette Lepore dress (perfect for cocktails!). Luxuriate In Lace These dresses, maximizing the use of lace, ensure that you will make a statement at that special occasion--and then some! Sure to dazzle are this Cordonetto-lace embellished dress in emerald green from Dolce & Gabbana, the embroidered lace gown with its beautiful neckline from Marchesa Notte and the Andoni corded lace maxi dress from Rachel Zoe. Select With Care No matter the style, it's important to make sure the lace itself is of the finest quality, such as Chantilly and Guipure. View the results! We found a chic and romantic V-neck sleeveless dress from Kobi Halperin in black Chantilly lace that proves the point. Shop this trend at Apprécier.